The Ohio River Bridges Project was created to increase cross-river mobility by improving safety by alleviating traffic congestion in connecting highways. The East End Project will connect the end of Louisville to southern Indiana. The Kentucky approach to the new bridge will extend to KY 841 from its current end at US 42, adding a 1.4 mile long four-lane crossing. Because this project will be expanding KY 841 into a four-lane crossing, the amount of impervious area will increase immensely. The increase in the impervious area combined with the increase in traffic meant that a new stormwater treatment system that could treat a large volume of runoff was needed. Engineers at Parsons Brinckerhoff selected the Vortechs stormwater treatment system from Contech. Vortechs is a hydrodynamic separator that combines swirl concentration and flow controls into a shallow treatment unit that traps and retains trash, debris, sediment, and hydrocarbons from stormwater runoff. The Vortechs was designed to treat a large flow - 34 cfs.The inflow pipe was made from RCP, while the outlet pipe was made from PVC. Both of the connecting pipes needed to be taken into consideration during the design and construction of the unit to ensure proper alignment to the precast vault of the Vortechs unit. The Vortechs was delivered to the site with its externals already in place within the precast unit. This allowed for a quick and easy installation, with a crane lowering the unit into place, followed by the top slab. In addition to design support, a Contech Field Consultant was on site for the entire installation of the Vortechs unit. 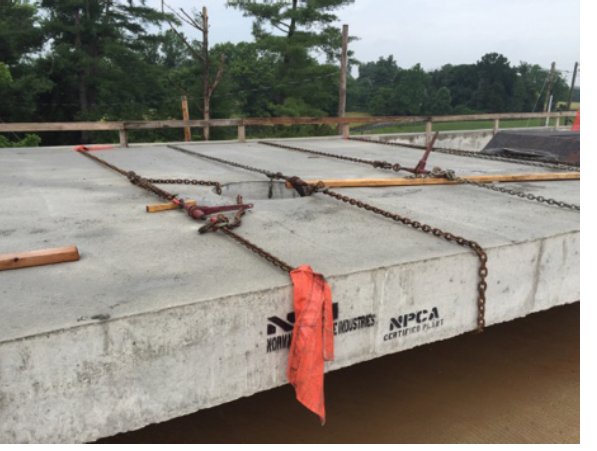 In the end, Contech was not only able to provide a solution that fit within the already tight budget, but also provide a unit that could handle the increased flow for the expansion of the new highway.